What would you say to your younger self as she was about to embark on her first diet? “Go on, you’re going to love dieting”? Or perhaps “this will make you miserable for the rest of your life so please, please don’t, I beg you”. Cherie Martin describes so well the cost of dieting. In our attempts to lose weight, we lose something much more important – ourselves. Every failed diet distances us from who we really are. Before long, the only way we view ourselves is through a lens of abject self-loathing. We yearn so much to feel better that we convince ourselves the next diet will “fix” us. In reality, what we need is self-compassion, empathy and a meaningful connection to ourselves. The process of finding our personal autonomy with food helps us to gradually renew that connection. As we begin to understand and accept our natural appetites and instincts, we can begin to understand and accept ourselves. If dieting takes us far away from ourselves, making peace with food can bring us home. ‹ PreviousHow are You Going to Eat for the Rest of Your Life? I hadn’t thought about the comparison, Lol, but you’re absolutely right. I also hadn’t thought about minimalism in those terms before – it feels completely different to think of it as “making room” rather than “letting go”. The thought of losing food as a coping mechanism can be frightening for people but, generally, we don’t let go of it until we’ve put something much better in its place – an authentic connection with ourselves that allows us to understand and acknowledge our emotional needs and meet them directly. Brilliant comment, thank you – you’ve really made me think. A great example of a fix that is not a solution to the real problem. Well expressed. I really appreciate you sharing your experience, Caz, and I think many people will take heart from what you say. What a dysfunctional relationship with food is trying to tell us is that we’re not relating to ourselves in the way that we need to – as you identify, working towards self-acceptance and self-compassion are key to recovery, as well as understanding our thinking about food. I wholeheartedly support your statement – “We deserve more than dedicating our lives to wanting to change and subjecting ourselves to misery in this way”. If only we put the same energy into really knowing and accepting ourselves life would be so much better for so many people. I am a lifetime member of weight watchers. The company has combined mind, body and spirit to form a balanced mindset in everything that we do. It’s no longer focused on a number on a scale. We have delved deeper to our issues and support each other through our struggles. It is no longer a diet but a balanced lifestyle. Thank you for your comment, Mary – I’m glad to hear that your experience is a positive one as I have many clients whose experiences have been less so. Thank you so much for this post. I have never heard anyone put it quiet this way–that we lose a little bit of ourselves each time we diet. But that is so true and insightful. Thank you. You’re very welcome, Shelly. I think that Cherie Martin puts it so well, doesn’t she? As our preoccupation with food and weight increases as a result of dieting we lose sight of who we really are. Ultimately, we can lose so much of ourselves, but it is possible to regain what was lost and find ourselves again. Many thanks for your comment, good to hear from you. Great post! I know how you feel when you say it breaks your heart to see young girls on Instagram who are berating themselves because they “cheated” on their diet. It hurts me to see those posts too. I also have friends who are my age that still live this lifestyle and it sometimes frustrates me because I want to tell them how to change, but I cant! They have to figure it out on their own. I wish they would all read your blog! Hi Merri, I thought you might feel the same as me when you see young women on social media beating themselves up when they go “off plan”. We can waste so much of our lives hating ourselves for something that’s not our fault. Likewise, you must find it frustrating when your friends talk in diet speak – I know I do! As you say, though, they have to figure it out themselves. Although, don’t they read your blog? 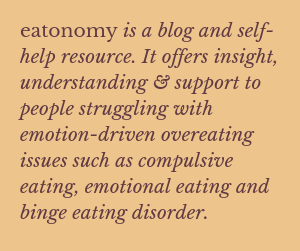 Some of them do read my blog, but I’m pretty sure some of them don’t put themselves in the same category since they haven’t suffered from an eating disorder. So they may think this doesn’t apply to them. And a few have told me how much sense this all makes but don’t seem to be able to apply it to their lives. This shows me how engrained this “calorie-counting, good food, bad food” mentality is in society. Thanks for reading! “Our innate internal perfection” – so well put! It’s impossible to develop a strong sense of ourselves when we only focus on what’s on the outside. There’s so much more to us that simply our appearance. Thank you so much for your comment.